It was a night to remember for the K-pop band’s Filipino fans. 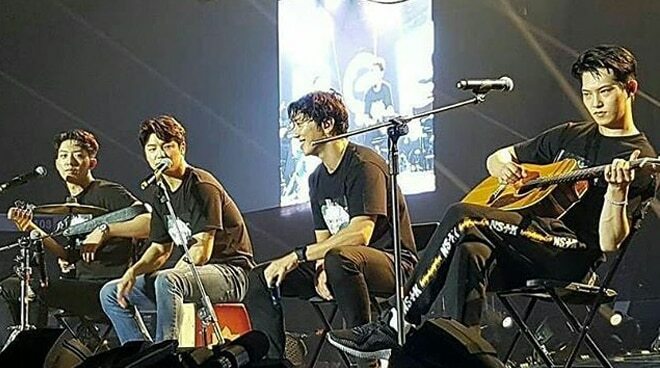 K-Pop rock band CNBLUE brought down the house during the last stop of their "petmalu" Between Us Tour. Filipino fans flocked to the Araneta Coliseum to party with the boys of CNBLUE composed of Jonghyun, Minhyuk, Jungshin, and Yong Hwa. Of course, the foursome didn't let their fans down as they gave an all-out performance accompanied by a spectacle of dazzling lights and visuals. Plus, they did a cover of the English song "Isn't She Lovely" by Stevie Wonder. Lead vocal, Yong Hwa, in particular, got the crowd giggling the entire time as he couldn't stop saying "Petmalu! I'm Your Lodi!" He even changed the lyrics of some of their songs to "Petmalu" and "Lodi" just for his Pinoy Fans. Yong Hwa is popular with Filipino K-pop fans, having starred in various dramas including You’re Beautiful and Heartstrings, both aired on ABS-CBN. Indeed, it was a night to remember for the boys who have proven that no one could match the Filipino Boice. WHOEVER TAUGHT @JYHeffect PETMALU AND LODI I DON’T KNOW IF I SHOULD CURSE YOU OR THANK YOU, BUT THIS WILL DEFINITELY HAUNT ME IN MY DREAMS TONIGHT.